LONDON (Reuters) – An experimental lupus drug from AstraZeneca significantly improved the symptoms of lupus in a mid-stage clinical trial, boosting prospects for a medicine the company believes could become a major seller. Only one new drug — GlaxoSmithKline’s Benlysta — has been introduced for lupus in half a century, underlining the difficulties of tackling the disease that causes the immune system to attack joints and organs. AstraZeneca’s sifalimumab works in a different way to Benlysta by targeting interferon, a protein involved in inflammation. In a Phase IIb study, details of which will be presented at the American College of Rheumatology (ACR) annual meeting, sifalimumab improved symptoms at all doses. However, there was an increase in patients reporting Herpes zoster, particularly at the highest dose. Sifalimumab is one of two drugs for lupus being developed by AstraZeneca’s biotech unit MedImmune. The other is anifrolumab, which blocks interferon more comprehensively. Early data, also being presented at the ACR meeting, suggests this second drug may be more effective. Bing Yao, head of respiratory, inflammatory and autoimmune medicine at MedImmune, said the company would decide which of the two drugs to take into final-stage Phase III trials after getting Phase IIb results on anifrolumab next year. 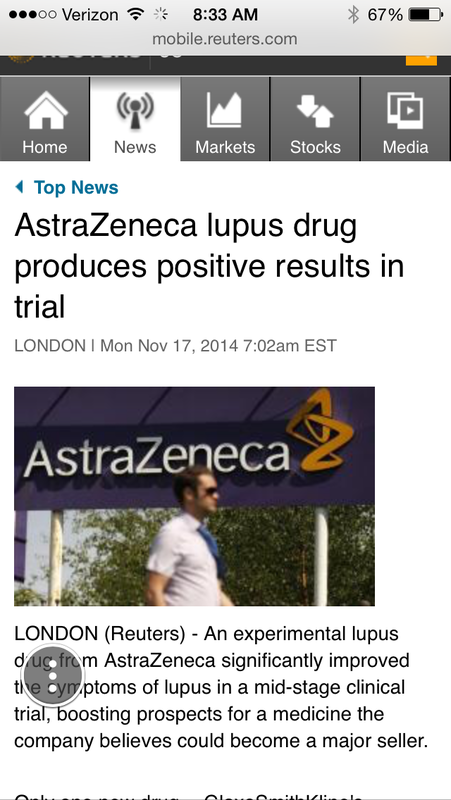 In May, AstraZeneca predicted the lupus medicines could eventually generate annual sales of around $1 billion. It made the forecast as part of a long-term sales projection in its defense against an unsuccessful $118 billion takeover bid by Pfizer. AstraZeneca will give a further update on its new drugs at an investor day on Nov. 18, just eight days before Pfizer is allowed to make a new bid under British takeover rules.